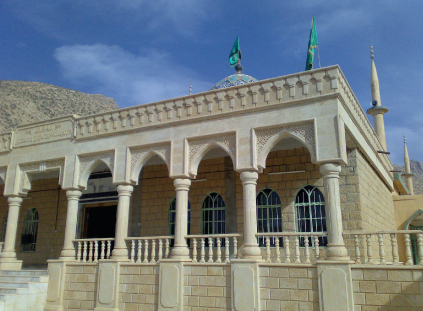 Several years before his marriage, Sayyid Ḥussein was told of a prophecy according to which he would have a son who would become a “reviver of religion.” This long-awaited spiritual leader, named ʿAbd al-Karīm, was born in 1824 CE in the village of Birjinza in today’s city of Sulaymaniyah in the north of Iraq. Shaikh ʿAbd al-Karīm grew to a young man of immense piety. He was totally given to the worship and the love of Allah. After having Bayʿa with his uncle Shaikh ʿAbd al-Qādir Qāzānqāya, who was the Shaikh of Ṭarīqa at the time, Shaikh ʿAbd al-Karīm went into retreat to worship Allah on a mountain called “Sara Girma.” He stayed in his isolation with Allah for four years. During that period, his food was confined to plant leaves and pure clay. He dedicated his night and day to worshipping Allah and remembering Him. Having completed disappeared for that long, people thought Shaikh ʿAbd al-Karīm must have died. However, one day his brother had a visionary dream that disclosed to him the place of the retreat of Shaikh ʿAbd al-Karīm. Eager to see his brother, he hurried to that place on the mountain which he saw in the vision. When he found Shaikh ʿAbd al-Karīm he was astonished by his condition. He asked the Shaikh ʿAbd al-Karīm about what he survived on during this years-long retreat, the Shaikh gave him a piece of red clay mixed with tree leaves and asked him to taste it. When he ate it, he found it amazingly tasty and was left for two weeks feeling satisfied in no need of food or drink. The time had then come for Shaikh ʿAbd al-Karīm to return to people to offer them guidance to the way of his grandfather, Prophet Muhammad (BPUH), the way of Allah. Shaikh ʿAbd al-Karīm succeeded Shaikh ʿAbd al-Qādir Qāzānqāya as the Master of Ṭarīqa ʿAliyyah Qādiriyyah. He became known as “Shāh al‑Kasnazan” which means “Sultan of the ghaib [unseen and unknown)”. His spiritual path became known as Ṭarīqa ʿAliyyah Qādiriyyah Kasnazaniyya (“Ṭarīqa Kasnazaniyya” for brief). The Shaikh settled in an unpopulated area in northern Iraq which became the village of Kirpchina. He built in Kirpchina many takāya (Sufi place of worship) and set up religious schools, turning Kirpchina into a center of knowledge and guidance to which people travelled from everywhere. Apart from his first four‑year retreat, the Shaikh entered another 40 retreats of 40 days each. As predicted years before his birth, Shaikh ʿAbd al-Karīm Shāh al‑Kasnazan revived the belief in and practice of Islam and re‑established the spiritual bases of Islam which had been neglected. His legacy is set to continue to the Day of Resurrection. The greatest Sufi Shaikhs of the time acknowledged the high spiritual status that Shaikh ʿAbd al-Karīm Shāh al‑Kasnazan attained. One of those great Masters was Shaikh Kāka Aḥmad whose shrine in Sulaymāniyyah in northern Iraq is visited by thousands of people yearly. When Shaikh Kāka Aḥmad returned from the pilgrimage to Mecca he came to Kirpchina to visit Shaikh ʿAbd al-Karīm, so Shaikh ʿAbd al-Karīm received him among a large number of dervishes. Before the end of his visit, Shaikh Kāka Aḥmad delivered a talk to the dervishes on the virtues of Shaikh ʿAbd al-Karīm. Among the things that he told the audience is the following: “Anyone who is unable to go to Baghdad to visit Shaikh ʿAbd al-Qādir al‑Gaylānī must visit my uncle Shaikh ʿAbd al-Karīm Shāh al‑Kasnazan, for he is his deputy. A visit to Shaikh ʿAbd al-Karīm Shāh al‑Kasnazan suffices as a visit to the Greatest Ghawth (Shaikh ʿAbd al-Qādir al‑Gaylānī)”. This great Sufi Shaikh departed from this world in 1902 CE after naming his son, Shaikh ʿAbd al-Qādir al‑Kasnazan as his successor as the Shaikh of Ṭarīqa Kasnazaniyya.